Sharon Cuneta also shares what were her takeaways from ‘Three Words to Forever’. 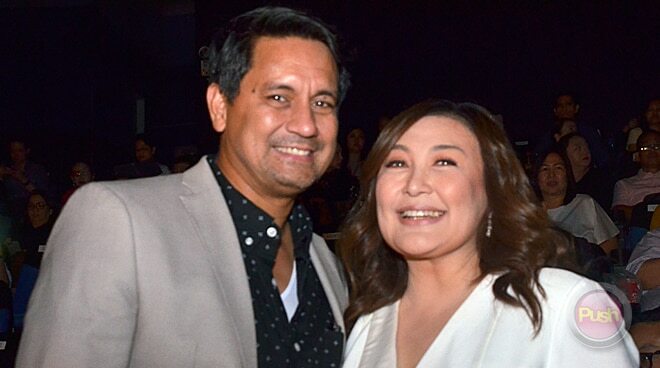 Having gotten through rough patches in her life as a mother and wife, Sharon Cuneta’s latest offering to her fans, Three Words to Forever, holds a special place in her heart as the story depicted some of her bitter realities in the past and in the present. “Ang dami kong na-realize actually sa movie na ito eh, especially sa relationships ko noong araw, nung bata ako. Siguro kasi nandoon si Kath (Kathryn Bernardo), tapos si Richard (Gomez) at ako nag-mature na. Parang nung bata ako, feeling ko, ‘Meron nga bang nagmahal sa akin na hindi ko kamag-anak? Talaga nga bang minahal ako, or kulang?’ Kasi ako, sobra [magbigay],” confessed Sharon. When it came to her role, some people would be surprised that Sharon, too, could easily relate to Kathryn Bernardo’s character. “I think more people would identify with the mother-daughter relationship with me and Kath. Kasi ako, takot talaga ako sa nanay ko. Tin was me. I was scared of my mom’s disapproval, disappointment. Parang nothing was ever enough. “But mom loved me, of course, very much. Parehas sila ni Kristina, [they] only wanted the best for their child,” revealed the actress. On a lighter note, Sharon also dished on her much-awaited kissing scene with onscreen partner Richard Gomez, who also happens to be her former boyfriend. “Very, very tame! I think a lot of people thought since this was a reunion movie, our fans thought that this was going to be a Sharon-Richard movie. [But] it’s a family movie. So, now they see it’s so wholesome. It’s really a team effort. We don’t take credit for it,” shared the 52-year-old star. Three Words to Forever, also starring Kathryn Bernardo and introducing Tommy Esguerra, is now showing in cinemas nationwide.